Get Them All With Our Box Set! * V.1 - Vocalize & Breath provides a thorough voice lesson consisting of a half hour of vocal warm-ups followed by deep breathing exercises and advice on posture and training. Ariella Vaccarino, creator of Voice Lessons To Go™, guides you through the exercises, providing vocal examples and piano accompaniment. * V.2 - Do Re Mi / Ear & Pitch Training focuses on improving your musicianship and sense of pitch. Filled with vocal exercises using solfege (Do, Re Mi), it is great for training your ear as well as warming-up your voice. The CD starts off with simple tone recognition, then moves on to solfege – concentrating on forms of the major and chromatic scales - and ends with “Hearing Your Note”, which teaches you how to hear and sing specific notes out of a group. 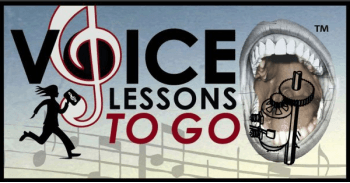 * V.3 - Pure Vowels is the next step in your vocal training. Designed for intermediate and advanced singers, Pure Vowels focuses on natural vocal production – learning how to shape the vowel – so that every word is clear and can be understood. The exercises are separated by the vocalizes on “ah”, ey”, “ee”, “oh”, “oo”, and “i”. 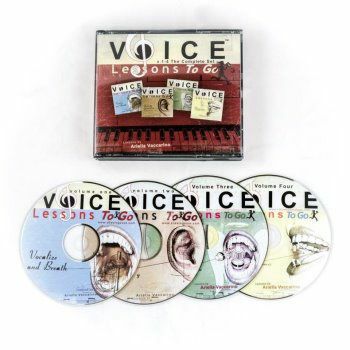 Part I of the CD is a walk-through with examples and explanations by creator of Voice Lessons To Go™, Ariella Vaccarino; Part II is straight piano accompaniment so that once you master the concepts, you can sing freely on your own without interruption. 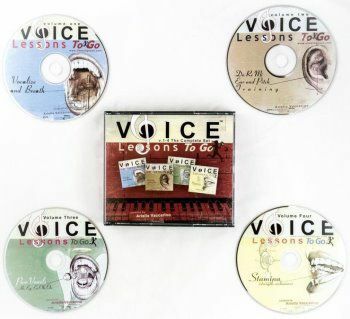 * V.4 – Stamina is the most advanced of all the Voice Lessons To Go™ CDs. Designed to challenge the singer, it is comprised of intricate vocal exercises that will strengthen your voice, improve your stamina, and increase your vocal agility. 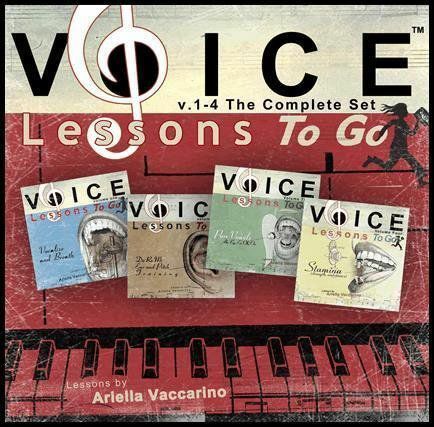 Part I of the CD is a walk-through with examples and explanations by creator of Voice Lessons To Go™, Ariella Vaccarino; Part II is straight piano accompaniment, providing a complete vocal workout, without interruption. The Complete Set is a Perfect Gift for the Singer in Your Life!